ESO Supernova Exhibition — How are exoplanets discovered? Most exoplanets cannot be seen directly. However, they reveal their existence by influencing the motion or the brightness of their parent stars. Transit passenger: Planet Venus crosses in front of our Sun and blocks some of its light. Likewise, we can detect the transits of exoplanets across the face of their parent star. 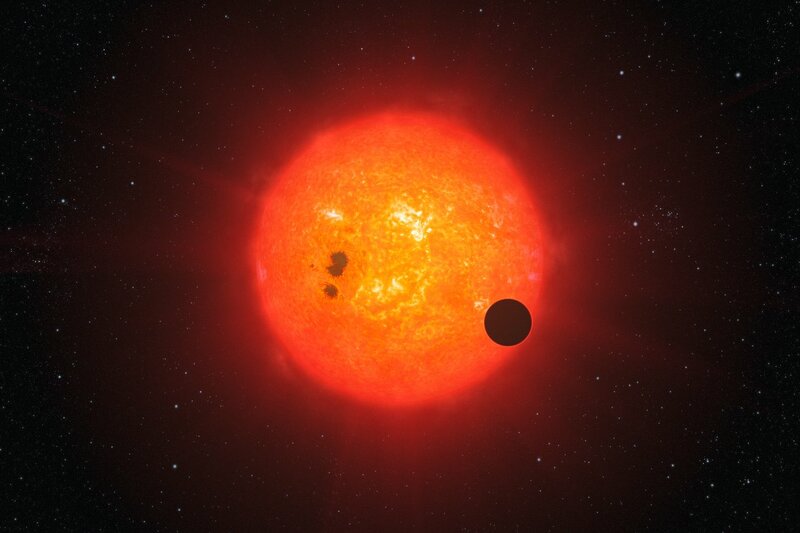 Exoplanets are so far away and so faint that most of them are invisible to normal telescopes. But they influence the motion of their host star, which wobbles periodically when a massive planet orbits it closely. This motion can be measured by making astrometric or spectroscopic observations. However, most exoplanets are found using the transit method: if the orientation is favourable, the planet passes (or “transits”) in front of its host star every orbit, blocking out a tiny fraction of the star’s light.Exoplanets are so far away and so faint that most of them are invisible to normal telescopes. But they influence the motion of their host star, which wobbles periodically when a massive planet orbits it closely. This motion can be measured by making astrometric or spectroscopic observations. However, most exoplanets are found using the transit method: if the orientation is favourable, the planet passes (or “transits”) in front of its host star every orbit, blocking out a tiny fraction of the star’s light. Telltale motion: Stars wobble owing to the gravitational pull of (unseen) exoplanets. When the star moves towards us, its light is blueshifted, while it is redshifted when it moves away from us. Partial eclipse: During a transit of the exoplanet WASP-19b, the light of its parent star is dimmed by 2%, as seen here by the Belgian TRAPPIST telescope. Look at the images on this panel. The light of the star has been blocked. As a result, faint planets orbiting the star become visible — if you’re lucky. How many planets can you see?